But first-time buyers cling to hope. Regulatory interventions in the lending market restricted access to credit for some home buyers and this was the catalyst for the broader housing market slipping into the contractionary phase, characterized by a softening in prices and a drop in the number of property transactions. The tighter credit environment has been a factor in the reduction in new home sales, but the deterioration in the broader housing market has also dented household confidence. Would-be new home buyers are far more cautious and this translates into weaker demand for new housing. And this time it’s not rising interest rates that have caused the downturn: Mortgage rates in Australia are near record lows, and the policy rate of the Reserve Bank of Australia is stuck at a record low 1.5%. Instead, the downturn was triggered by sky-high prices in one of the world’s most fabulous housing bubbles that smacked into a regulatory crackdown on some of the elements that had made those sky-high prices even possible: Mortgage fraud, bank wrongdoing, reckless lending, and excessive property speculation aided and abetted by the banks. 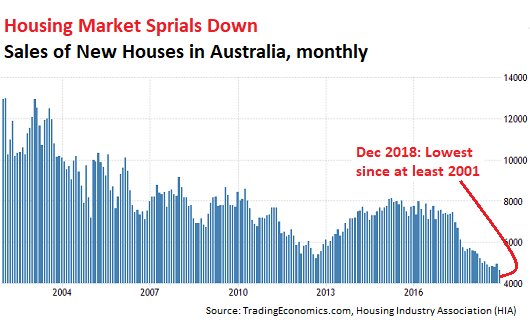 And so, as a consequence, the housing market in Australia, particularly in Sydney and Melbourne metros, has started spiraling down viciously. And given these price drops – in Sydney, prices have already fallen by the double digits – and the regulatory crackdown, investors no longer have the hots for speculating in this market, and banks no longer have the hots for lending to them. Interest-only mortgage were a favorite with investors. Then regulators limited the big banks in terms of what portion of their originations could be interest-only mortgages, and banks looked at speculators with greater scrutiny. 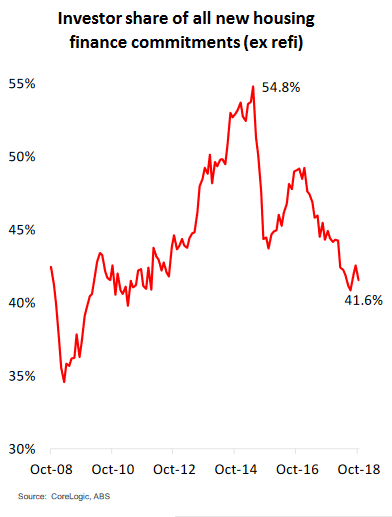 And now, according to CoreLogic, interest-only mortgages have plunged from 45.6% of purchase-mortgage originations in 2015 to just 16.1% at the end of 2018. This is by far the lowest investor share in the data going back over a decade. Even in 2008, during the Financial Crisis, interest-only mortgages bottomed out at a share of 27%. But first-time buyers are still trying to buy, and demand from them has increased in 2018, according to CoreLogic, “on the back of incentives, falling investor demand, and falling values in the largest cities.” But in the big cities, they’re mostly limited to buying lower-end condos, and not single-family detaches houses. So for now, much of the impetus for the deflation of the housing bubble comes from a portion of investors and speculators that are trying to stay out of the way of the steamroller. While prices at the low end — realm of the first-time buyers — are hanging on, prices of more expensive homes are falling at a rapid clip. But it wasn’t the central bank that pricked the bubble. Read.... The Housing Bust in Sydney & Melbourne, Oh My!